This entry was posted on Thursday, October 29th, 2009 at 1:55 pm	and is filed under Family, Inspiration, Interesting. You can follow any responses to this entry through the RSS 2.0 feed. Both comments and pings are currently closed. Agreed. This photo drips coolness. 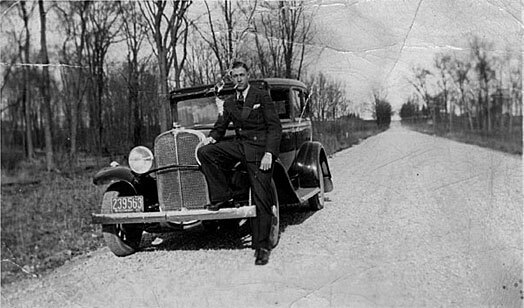 I have one similar of my gpa and gma in front of their Model T – looking like Ozzie and Harriet. Awesome photo and “impossibly cool” is really the perfect title for it. Your Grandad isn’t just cool. He is very effing cool. Looks like he’s just been on pimp my ride AND won the lottery. I came across this amazing picture, and i was quite curious as to whether I may or may not be related. Im from oshkosh, WI, my fathers name is Brian, his fathers name is Ronald, and thats as far back as i know. i would appreciate any information…GREAT picture by the way!! !